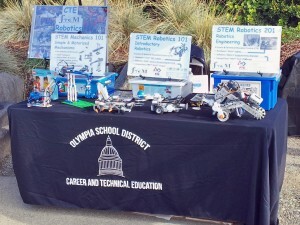 The Olympia School District hosted at booth at the annual Harbor Days Event over Labor Day weekend. Several STEM programs were featured in the display, including the new STEM Mechanics 101 course (supported through this STEM Pals Matching Grant program), and the CTE STEM Robotics 101 (Introductory Robotics ) and STEM Robotics 201 (Robotics Engineering) courses. 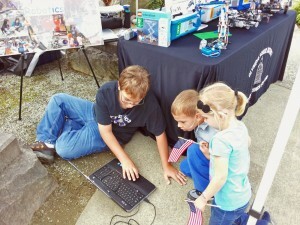 OSD Robotics teachers and students gave community members a hands-on experience with each level of the STEM program. In addition, STEM Pals provided information on how Harbor Days attendees could become involved in STEM Education, with a particular emphasis on finding volunteers and sponsors for our Middle School and High School Varsity Robotics Teams as they prepare for the FLL and FTC competitions respectively. We would like to thank everyone from the community who gave us such a warm and encouraging welcome.